We don’t talk much about the EEO-1 report on The Employer Handbook. But here are some on TLNT. 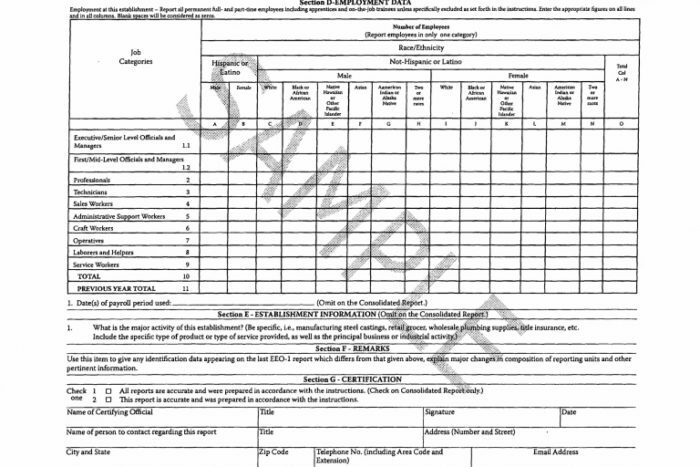 The EEO-1 is the federally-mandated survey of company employment data categorized by race/ethnicity, gender and job category Companies with 100 or more employees must file it each year. Certain federal contractors with 50 or more employees must file the EEO-1 too. When must covered employers file the EEO-1? Due to the recent partial lapse in appropriations, the opening of the EEO-1 has been postponed until early March 2019. The deadline to submit EEO-1 data will be extended to May 31, 2019. Details and instructions for the 2018 EEO-1 Report filers will be forthcoming. Please continue to visit the EEO-1 website in the coming weeks for schedule updates. If you have additional questions about the EEO-1, the EEOC has a list of answer to frequently asked questions, which you can access here.